Majella Lennon Dalton, the Claregalway milliner who walked away with the much coveted Best Up and Coming Milliner award in Derry recently. The mother of three is a relative newcomer, she set up her business three years ago. A Claregalway woman with a background in engineering walked away with a major millinery award in Derry recently. 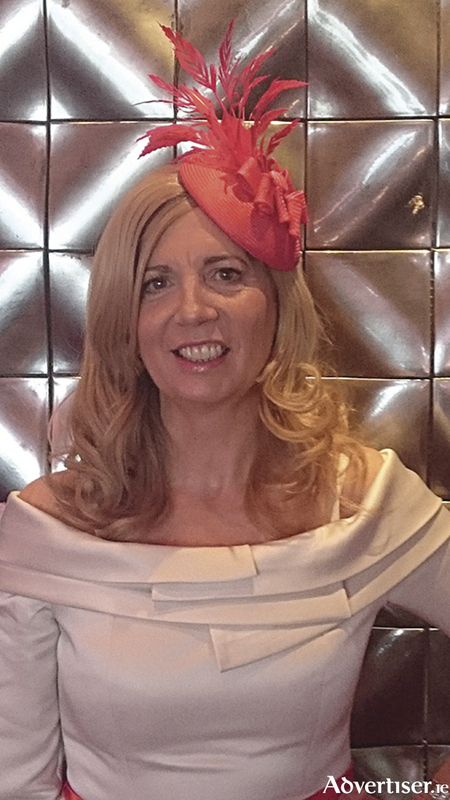 Majella Lennon Dalton from Monroe, Knockdoe, won the award for Best Up and Coming Milliner at the Hatwalk Awards recently which were hosted by Noel Cunningham, the TV3 showbiz star. The mother of three, who will feature on a special milliners' episode on Irish TV on April 7, walked away with the prestigious prize for her summer creation. "The brief was to design a hat for a formal summer garden party where the men wear morning suits and the ladies wear the best of Irish design," explains Majella. "The headpiece was to make the lady stand out from the crowd but had to have an element of Irish culture in the design. I based my design on Celtic symbols of the love knot and the Awen [inspirational muse of creative artists] symbolising the balance between male and female. The hat base was raspberry parassisal and the love knots were created using cream and raspberry silk sinimay." She is a relative newcomer to hat making, having set up her company Crevation Design three years ago. It specialises in quirky designs which are inspired by classic and vintage styles. She holds an engineering degree from NUI Galway and worked in AT Cross in Ballinasloe for 12 years in manufacturing, process development and as a research and development manager before the company moved its operation back to the United States in 2001. "At that stage I had three children under two. I took some time out to spend time with the children and took up art as a hobby. I totally enjoyed the creative escape which art brought and went on to do two years in GMIT in Fine Art and Design. I ended up getting back to work on a contract basis but hope to some day get back to finish the course." In 2012 Majella did two millinery courses at GMIT with the milliner Jaime Nancy Barron. "I was totally smitten with the process and the design possibilities. What started as a hobby became an obsession and that’s where Crevation (creativity and innovation ) Designs originated. I also trained with the talented Lina Stein in Westport and Carole Maher from Australia. I operate from a studio in my house." Her talent was recognised almost instantly and her designs have featured in the top 20 slot at Ladies' Day at the Galway Races for the past two years. She concentrate mainly on Mother of the Bride/Groom and wedding guest outfits. However, she also loves to design couture pieces for the catwalk, races and design competitions. "Coming from an engineering background I love to mix new innovative materials and textures and play with structure and form to create classic, easy to wear pieces. Having also studied Fine Art and Design I also working with colour. My aim is to provide each client with the perfect handmade design to complement their personality and style. This is a fun process, involving an initial visit to select the design/colour/materials/embellishments and a second visit to fit/finalise the design and if necessary, a final visit to collect your finished 'crevation' (creativity meets innovation )." Page generated in 0.1930 seconds.